Due to high quality brand products Amoi known not only at home in China, but also worldwide. Its existence the company started in 1997 in China's Fujian province. Its main activities are focused on the production of tablets and mobile amoi phones and mobile communication services in China. Name brand Amoi was the old name of the city of Amoy, which now has the name of Xiamen. Currently, the city is one of the major ports in the entire Taiwan Strait. Currently, the number of staff more than 6000 people., And its assets amount to more than 3.2 billion yuan. As the consumer market within their own country and abroad - Amoi company produces an extensive range of mobile phones and tablets amoi, as well as some kind of household appliances. Thanks to the professional managerial skills of its employees, the company's products are supplied to all corners of the globe. Despite the widespread popularity of mobile phones Amoi in the world markets, consumers still fear to look at China's products. Despite this, the Chinese products Amoi phones have long been among the top ten world producers. Produced modern mobile phones and smartphones running on the Android operating system, which in recent decades the most effective. At its arms using multi processor MediaTek, which has worked well for another produced 2-core and 4-core devices. If you look at the catalog of any online store we can safely say that the products manufactured phones for both business-class use, and for a budget option. Amoi Mobile phones equipped with internal fillings from world famous manufacturers: Intel, AMD, MediaTek on the latest technology developments. That naturally makes them compete, along with other similar products on the highest level. 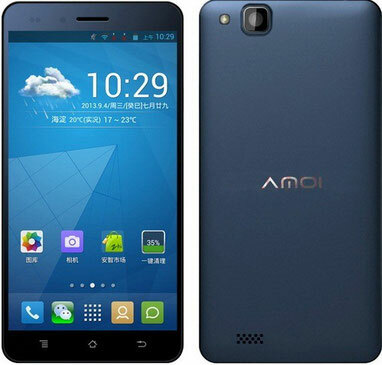 Especially popular among buyers won amoi smartphones, which, unlike mobile phones have a wider screen size, the ability to talk on Skype connection from anywhere in the world. As a rule, they are equipped with two SIM cards that work with any mobile operators, as well as have a built-in firmware version of Russian Language bar. World innovation does not stand still, because each manufacturer of its products is fighting for the top places in the rankings catalogs of electronic products. No exception here and become a Chinese company Amoi. Already, around the world, many shoppers pelted company responses to reservations in the forthcoming production A900W smartphone. Its main difference from the direct competition «Huawei», «Lenovo» was to equip 4-core processor, as well as high-quality HD OGS display having a resolution of 1280 x 720. The smartphone is also equipped with built-in products from Sony 8-megapixel rear camera. Not far behind in the development of the company and tablet technology. It hit the top of sales of online stores in the former Soviet space has become released in 2014 dual-core tablet computer Amoi Q50HD. He became a practical highlight all office workers. Built-in packages MS Office Word, PPT, Excel allow you to work on your tablet Amoi various documents. As seen in the company obsessed with the development in the field of innovative technologies in the production of mobile and tablet devices. Due to the high quality and professionalism of the developers of its products on the world market has formed the core of their regular customers. Analyzing customer reviews can be a solid top five assert that Amoi company's products have strong competition at a low price. Reliability and durability of operation indicates the high quality assembly and assembly of parts and components from world manufacturers. Availability of most products of the company depends on its market. If a wide range of mobile phones and tablets a few years ago could only be found abroad, now the choice of products of Chinese companies available to citizens of the CIS, Baltic states and other states which are not members of the European Union. By monitoring the company sold products increasingly focuses not on the quantity but the quality of the manufactured product, its price and popularity among consumers. Despite the fact that the company's products are still little known in the world market, it is worthy of the competition stacks up to other manufacturers. Thus winning the hearts of his admirers low pricing and high quality products. On this page you can download AMOI PDF user manuals.